They mightn’t yet be available to the masses, but the Samsung Galaxy S6 and S6 Edge are two of the major talking points in the tech world just now. Given the drama that followed the release of the iPhone 6 and iPhone 6 Plus last September – with some users claiming that the larger one of the two devices was bending out of shape when squirreled away in the pocket – the Edgier of the two new Sammy handsets has just been given the obligatory stress test. Does it bend, though? Find out after the fold! The whole Bendgate situation was borderline farcical, since despite only a handful of complaints from millions of initial sales, it was portrayed in a way that led folks to believe there was a large-scale problem with the manufacturing. Such was the fanfare, that Apple even had to step out and clarify the situation, and while many of the Cupertino company’s competitors lapped up the opportunity to poke fun at a rival, Bendgate seemed to die down as quickly as it made headlines. Still, with folks taking a perverse pleasure in destroying some of the most sought-after new gadgets on the market, it has added another dimension to the drop-test community, and with the Galaxy S6 Edge looking to make an impact upon arrival next month, the Chinese Smartphones Review channel on YouTube has sought to answer the million-dollar question. 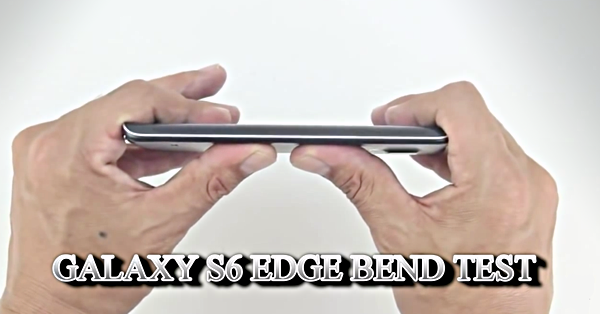 As you will see in the clip below, the answer is a defiant “no,” and while most consumers wouldn’t go out of their way to try and bend such a device, it’s good to know that the S6 Edge is rugged enough to cope with the pressure. Such experiments often claim to present us with a roundabout assessment of a device’s limits, and while I don’t tend to agree with drop tests for this purpose, the clear strain being placed upon the Galaxy S6 Edge indicates that it is down for the fight. Samsung has taken a real gamble in removing perks like removable battery and microSD slot in favor of a more premium design, but where Apple’s iPhone 6 caught the headlines for its perceived fragility, it seems unlikely that the S6 Edge will have to endure the same negative headlines. What i want to see is one of these guys bending the phone, the glass breaks and filets open a finger!! This guy hasn’t got enough muscle to bend small peace of metal, Just kidding. Curved glass doesnt bend. You’re welcome.